How is your Rudder/Nose wheel wired? Separate channels or only a Rudder channel? I was able to use the same solution with two of my other jets configured with PB Mercury SRS units, just had to go into the Mercury SRS setup and change the second Rudder Channel to "Direct n"
My T-1's OEM brakes do not engage until you have enough power applied that they lock up the wheel. Then, they snap the disk over and lock up. if you back off they become proportional. I am thinking that the electromagnet needs a lot of pull to get the disk off the retraction magnets in the hub. Once it has enough power to do that, that is enough power to lock them up. Makes for a bad braking experience every time. I am wondering if this LG 15 overcomes this mechanical design flaw. ?? Not sure how it could. Has anyone figured this issue out? My brakes are almost like yours...worse on the T-1 then the mini....not proportional grab like crazy, when relax and re-apply they grab again. So removing these magnets and putting this controller, I hope all will be perfect. I have another jet also with JP brake and they don’t grab at all....I need to take them apart to see the difference. len i had the same problem as you with the original brake controller. all i can say is that the lg15 works perfectly. no lock up and tracks straight when you apply brakes. i forgot to mention after you set it up it works great. tom explains how to set it up in his thread. he did a great job. I am thinking about removing the magnets in the hub. Then it won't take nearly full power to get the disks moving toward the electro-magnet. But, I have posed the problem and my theory of the potential design problem to Dirk to see what he says. So I'll wait until a couple days after the holidays to see if he answers and what that answer may be. My prolink gear on the UFlash do not have magnets in the hub. It still took a lot of trial and error, a little machining and some sanding to get them matched up so they would brake evenly. But I still ended up having to put an LG 13 on them to keep them from locking up. It sounds like the LG 15 might help on both planes. But, I want to solve the obvious mechanical issue on the T-one before I dump more $s into either plane. Of course, if the markets make a fantastic recovery, then maybe I'll celebrate with a couple new brake controllers. These early versions of electric brakes are certainly compromises compared to what is out there for air operated brakes, and the component assemblers do NOT take any time to take the rough edges off the stamped and threaded components. If I do go to LG 15s, then I understand that I have to ditch the 2S LiPo on the gear. Thanks for the info. What specifically effect happened and what did you not like about it? they didnt lock up as bad. the main problem was the uneven braking. just not enough of an improvement for me. i didnt want to waste any more time messing with them. to me it was a lost cause.. Anybody greasing the disks? That way they should not lock up once they snap out to the electro-magnet. If you are greasing them, are you using High Temp grease or maybe just something light like servo grease? I don't think greasing the tires would work on the T-One's OEM gear. I know folks who have done these work-a-rounds. But, I would like to get the brakes working correctly. If the LG 15 is able to work well with the magnets still in the hub, anyone know how it overcomes the tendency for the disks to snap out and lock up? One of the things I found on the prolinks was that, with the LG 12, I had to take off all the rough edges on the disk and I even sanded the ends of the guide screws a bit to smooth them out. Also, I filed and sanded round the IDs of the screw holes and the axle hole in the disk. I also used 220 on one disk and 400 grit on the other to get them to match up when the brakes were applied. Once I did that, they worked fairly evenly. But they did still lock up, and with the LG12, I was never able to get a good travel adjust setpoint on the Txer to overcome the locking up. Never IDed a problem with the disks just free floating inside the hubs (i.e. the disks always seemed to back off after braking).Then, I traded the LG 12 for a LG 13 and then that solved the locking up. Maybe I'll give the LG15 a try. I have all winter to figure out the programming. The manual seems straight forward. But from the instructions above, I know it will take some time. At least you don't have to have a separate GSU to program it. But, … I already got that for the LG13. Also, I am beginning to collect a junkyard of electric brake controllers. I'd like to find one that really works with the T-Ones OEM gear. I was going to buy a complete spare set. But, if I can NOT get them working, then I would like to try someone else's brand, maybe Electrons. Last edited by Len Todd; 12-28-2018 at 10:09 AM. For those who have bought the LG15, did you go with Pacific RC's? I see Dreamworks' LG15s are factory programmed for specific sets of Dreamworks gear vs. having the ability to adjust current limits, etc. i bought mine from Dirk at Pacific. Well, … I just took out the magnets in the hubs and the brakes come on really nicely. The proportional aspect works w/o having the disk snap out and lock up. After playing with the travel adjust a bit. I found a sweet spot for maximum resolution w/o any lockup. But, … when fully on, one side offers a slight bit more resistance than the other. I suppose this is where the independent adjustment of the LG15 comes into play, let alone the Gyro compensation when the model starts to vary from its designated path due to uneven braking. Guess I'll order a 15 today. This would help my UFlash also. By the way, I also rounded all the inner and outer edges and bolt hole edges on the disks. Also, previously I found that the bolt that holds the wheel on can compress the two bearings together. I suppose that is why on mine the one side's bearings failed. I think the shoulder on the axle needs to be cut back about 1 mm further so that the bolt does not compress the bearings. But a good work-a-round is to just add a 4mm lock washer under the bolt on the end of the axle. Then you can tighten the bolt w/o compressing the bearings. By the way, the bearings are not sealed. They are just shielded. Also, there is a .025 MM thick x 10 MM x16 MM washer in there between the shoulder and the inner bearing race. On mine, one side had one and the other did not. ?? These can be purchased on Ebay, but make sure you check the delivery schedule. One vendor had a 1-3 months delivery schedule. These can be had from the lower 48 in a couple days. Anyway enough for today on E-brakes I have to go order some stuff! Okay...silly question. I've search the manual and read this thread. How do you hook up the JP two-wire retracts and brakes to the three-wire connectors on the LG-15? Not silly to ask. I was already quite fustrated when had this same problem. With 2-pin brake connector included with C&C kit they just didn't work. Luckily my friend gave me a hint. 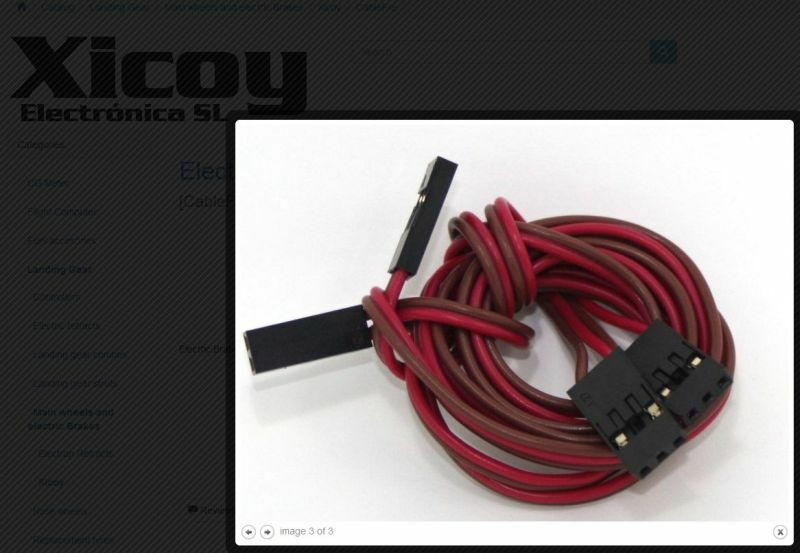 You propably need this cable or equivalent from 3-pin servo lead body combined with your current connectors. I didn’t do the change yet, but I can say I never think of this....I will just pull the pins and insert them in a servo connector, if they don’t fit....I will just install new pins. The Castle BEC comes set at 5 VDC output. I have a Castle Link but it may not be a Version 3, which is the current version. I used the one I have now to set the ESC in my Blade 180 Heli. Did you get a Version 3 to change your output voltage? Or, I am wondering if my Castle Link will work. Got any idea on that? Thank you both! That did the trick. I just took the pins out of the two wire plugs and put them in three wire plugs as shown in the picture you attached. I can't wait to try this thing out and hopefully I won't be skidding all over the place on my landings. Last edited by T3chDad; 12-29-2018 at 01:50 PM. 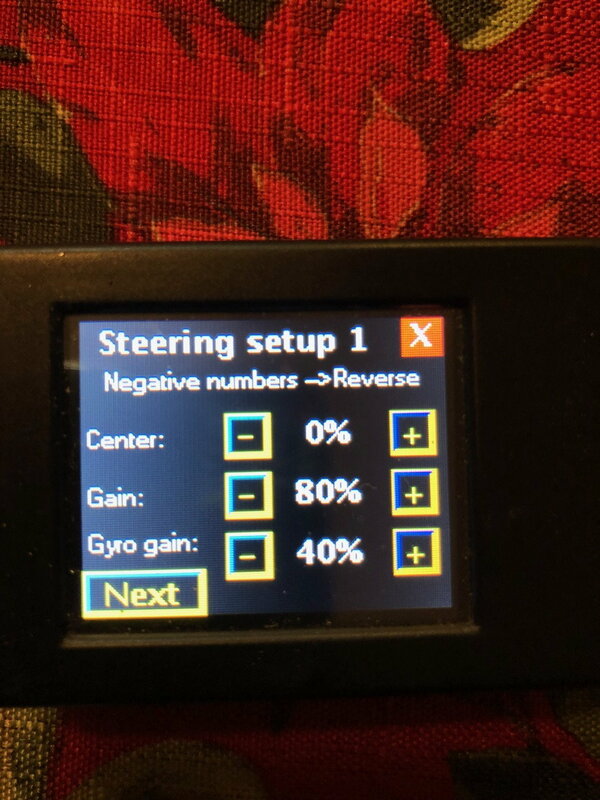 I don't remember the difference between Gain and Gyro Gain, will need to review the manual and update this post. However, these are my settings that work well. Thanks for going through the trouble to make this post/guide. It has been very helpful. After tweaking this stuff today at the field, I figured out the "gains" on the screen above. The first "gain" you have set at 80% isn't really gain at all (at least how I think of it anyway). It's simply how much steering from the transmitter you want coming through to the Xicoy system. Decreasing this value has the same effect as decreasing the throw/endpoints on your overall steering. The "gyro gain" is just that, more or less. The larger this value, the more steering input the gyro delivers. Hope this helps clarify this page. I’m not sure what version of Castle Link I’m using, but it’s been around for at least 4 years. I used it to change the output voltage to 7.5v. I bought mine directly from Xicoy, but that was before Dirk started selling them. You have to careful buying the units that are setup for a specific brand of retract because the cutoff amperage is factory set for those specific retracts and is not user configurable. The GS-200 from Electron is an example of an LG15 pre-configured for Electron Retracts.